Headey as Sarah Connor in Terminator: The Sarah Connor Chronicles. In November 2005, 20th Century Fox announced that it would produce a television series called Terminator: The Sarah Connor Chronicles featuring the adventures of the title character and her son in the years after Terminator 2: Judgment Day. This was followed by a November 2006 announcement that Lena Headey had been chosen to play Sarah Connor. The choice to cast Headey has been criticized by some fans and critics, notably those who feel only an athletic, muscular woman should fill the role established by Hamilton, who transformed her body into that of a muscled warrior for Terminator 2. The controversy has been covered by the Los Angeles Times, The Boston Herald, and The Guardian, as well as in online forums. The television series intentionally ignores the continuity of the third film, and it is essentially a sequel to the first two movies and is a “new” version of T3. The series opens in 1999, a few years after the events of T2. Sarah and John Connor seem to be living a peaceful life. Living undercover after being blamed for the murder of Miles Dyson, Sarah is even engaged, to paramedic Charley Dixon. However, Sarah, fearing discovery, and perhaps, as John suggests, the certainty of a stable life, forces the two of them to flee again. On his first day in his new school, John is attacked by a T-888 Terminator posting as a substitute teacher called Cromartie. He only escapes with the help of Cameron, a teenaged girl Terminator sent back to protect him. Sarah hears of the shooting on TV and rushes to the school, but is captured by Cromartie, who uses her to lure John into a trap. Again with the help of Cameron they escape, fleeing to a bank where resistance members have hidden the parts of a time machine. As Cromartie attacks them, the trio disappear. When they reappear, it is the year 2007. 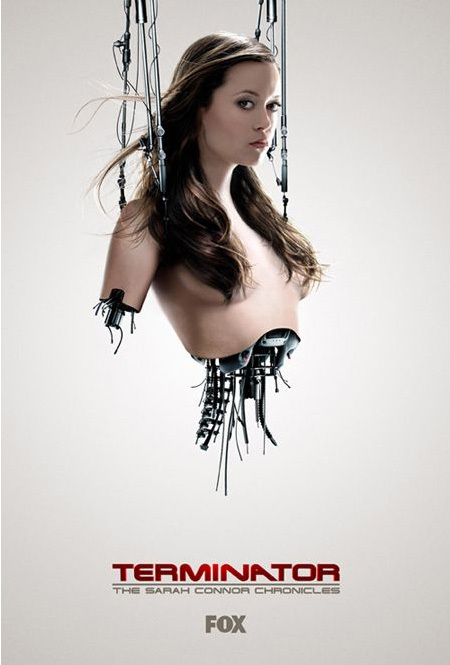 Cameron suggests to Sarah that their purpose in this time is to stop Skynet, which she claims will go on line in 2011. Sarah argues that time traveling was a wrong move and that if she had been allowed to stay in 1999 she would have had longer to prepare John and to prepare to destroy Skynet. It is at this point that Cameron informs her that she would have died in the intervening years of cancer. Traveling to the future has given Sarah the time she needs to destroy Skynet in its infancy. As the three of them attempt to evade discovery, and track down the origins of Skynet, Sarah is burdened with the extra knowledge that her own body might betray her. The third episode of the series shows Sarah at a doctor’s appointment where she is informed that she is completely healthy. Nevertheless, she seeks preventative measures from the doctor, hoping to avoid cancer altogether. Later episodes show her more intensively training her body, and she also is seen taking a handful of vitamins and medications. Sarah’s relationship with Cameron has been repeatedly antagonistic and mutual distrust, as she attempts to teach her the value of a human life, however Cameron also argues the importance of their mission to thwart Skynet’s creation even if killing is necessary. During battle, Sarah and Cameron would find themselves working together. In the episode “Queen’s Gambit“, she discovers that her deceased lover, Kyle Reese, has a brother named Derek, who’s also a time-travelling Resistance agent, after the authorities arrested him for the murder of Andrew Goode, who was a friend of Sarah. Derek claims that he didn’t murder Andy to Sarah in the prison’s interrogation room. Tormented by the memory of being unable to save Kyle, she hopes to save Derek from a similar fate after he is badly wounded by another cyborg; a T-888 Terminator. After she revealed his true identity to John, he seeks the aid of her former fiancé, Charley Dixon, to save his uncle from dying. In the episode “Dungeons & Dragons“, it is revealed that despite her knowledge that he’s Kyle’s brother, Sarah continues to harbor distrust of the man, possibly because she doesn’t believe that he didn’t commit the murder. On the episode, “Vick’s Chip,” her suspicion of it has been confirmed. Despite their mutual distrust, there are some attractions between them. In the episode “The Demon Hand“, a secret was revealed that Sarah kept from John; that she signed off her parental rights during her stay in the mental institution. Excellent Show. Fox has done a great job of bringing this story to the TV. Great actors. I even like the ex-90210 dude. lol Absolutely love Summer Glau as Cameron. If Sarah and John are successful, John is never born.